This entry was posted on February 12, 2011 at 11:00 am and is filed under fit of clothes. You can subscribe via RSS 2.0 feed to this post's comments. Both comments and pings are currently closed. 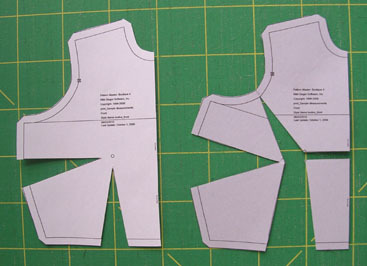 When I first started to do pattern alterations, I found the fact that the pattern pieces looked different from what I recognised to be very worrisome. Though it looks as if the armhole that you end up with after doing an FBA is very different from a “standard” armhole, once the dart is actually sewn shut they will have an identical configuration, which will allow whatever sleeve you use to be stitched in without problems. Good point, Indigotiger. Thanks for making that clear ! Good question Saz – I hadn’t made that at all clear. Look at my first photo, on the right with the wedge added. 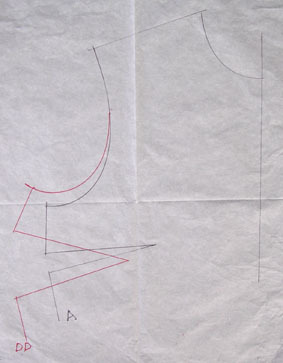 – the bust dart from the side seam – yes you’ve added extra height to the pattern piece to cover the larger bust, but you want the side seam length to be unchanged, so the dart is deeper. – the waist dart if you want one : sew the dart the new width at the waist but tapering to the bust point (well about 1.5 – 2 inches, 3.5 – 5 cm from the bust point), not right up to the armhole. The new dart is wider, as you’ve added more fabric across the pattern piece to accommodate the larger bust. But you want to get the waist seam back to the original length. Please ask again if that isn’t clear.